If you need proof of how true his observation is, look no further than the Capital Group, a conservative, trusted financial services company that – until recently ­– lagged far behind its competitors in thought leadership and digital marketing. “We were hiding our light under a bushel,” says Will McKenna, describing the company’s marketing efforts in the talk he and Fred Macri gave at Content Marketing World 2017: Awakening a Sleeping Giant: Crafting a Successful Content Brand in an 86-Year-Old Enterprise. The Capital Group, which manages $1.7 trillion in assets, had amassed many loyal financial services advisors as clients. Yet it risked losing market share to competitors that more openly shared insights ­on news that affects investment decisions. Fred and Will tried something to catch up to – and even leapfrog – competitors. Their idea? 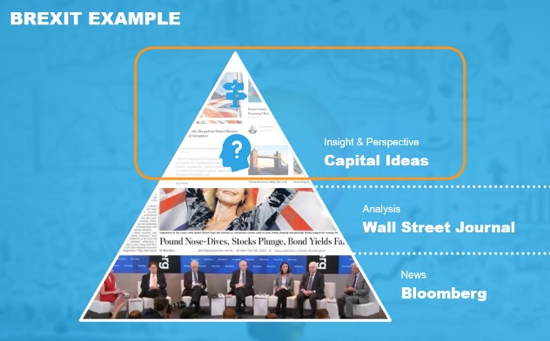 Create a content brand: Capital Ideas. Launching a content brand is one thing. Making it a success is another. Capital Group succeeded because it positioned its content to provide answers its audience is hungry for – answers it’s uniquely capable of providing. Fred and Will’s story offers many takeaways for anyone launching a new content initiative. Ask (and answer) why a content brand makes sense. Choose the content you will (and won’t) focus on. Stay plugged in to audience needs. Invest in your email newsletter. Find internal supporters to help promote the content. Recognize that paid content promotion pays off. Customers were eager to hear what Capital Group had to say. And the firm was full of investment professionals around the world – 300 or so – looking at stocks all day and coming up with insights. “We saw that we could use content marketing to engage our audience,” says Fred, who heads content marketing at Capital Group. 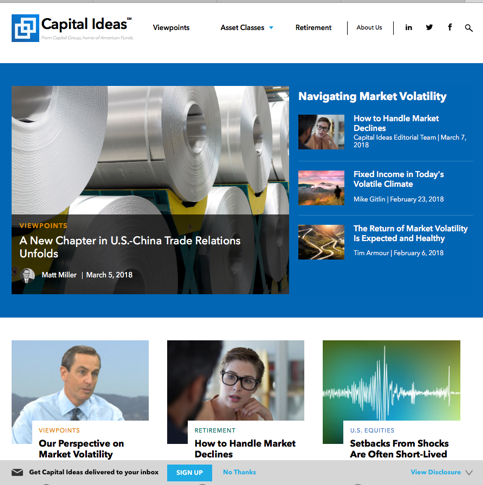 Capital Ideas gave the company a thought-leadership platform as well as fuel for the company’s paid, earned, and owned media initiatives. Today, Fred shares, Capital Ideas provides 60% of the content the company uses across social media, native advertising, and paid content distribution. After you identify the business problem that justifies your content brand, decide how to deliver “overwhelming value” to your audience on that platform. In other words, choose the content that you will (and won’t) focus on. 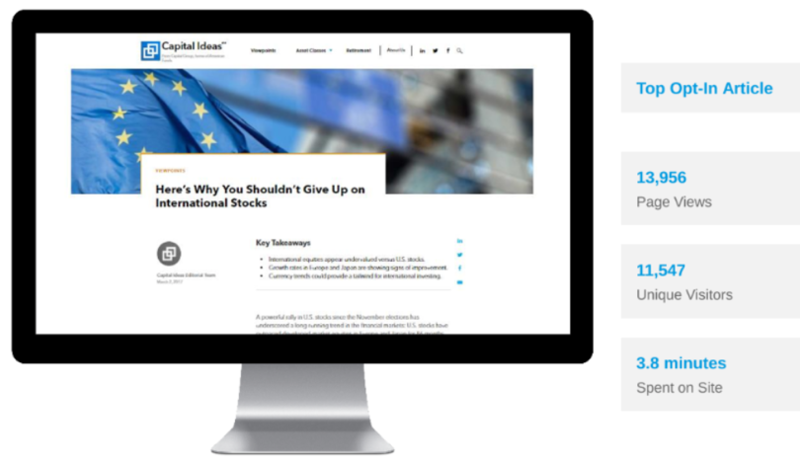 Since Capital Group is built on long-term investing, Capital Ideas focuses on long-term considerations related to events in the news. That means not focusing on the immediate news (what happened?) or the analysis of news (why did it happen?) at the bottom of this pyramid. Instead, Capital focuses on delivering perspective (what does it mean?) and insight (what should I do?) at the top. Fred gives an example of the Brexit news coverage. Bloomberg printed daily news stories (what had happened) and The Wall Street Journal provided deeper analysis (why it had happened). 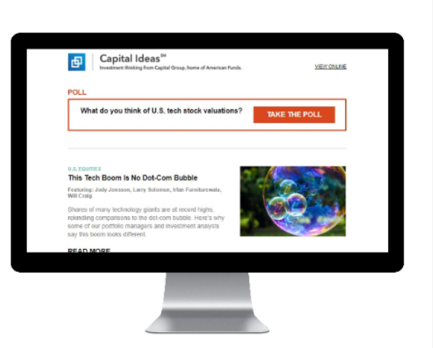 Conduct polls on Capital Ideas site. Track analytics to see how their audience responds to their content. 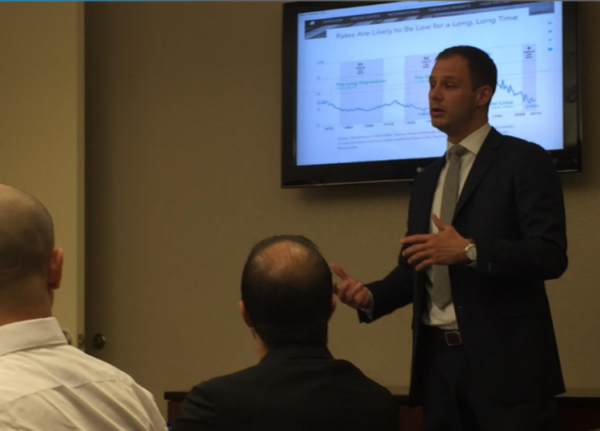 Hold webinars (attended by thousands of advisors) that give the company’s take on the investment landscape – and conduct polls there, too. In response, the Capital Ideas team published the answer in what became their top opt-in article. The Capital Group puts love (aka time and energy) into its Friday email newsletters – and it has over 30,000 subscribers to show for that love. And they’re headed toward their goal of 100,000. 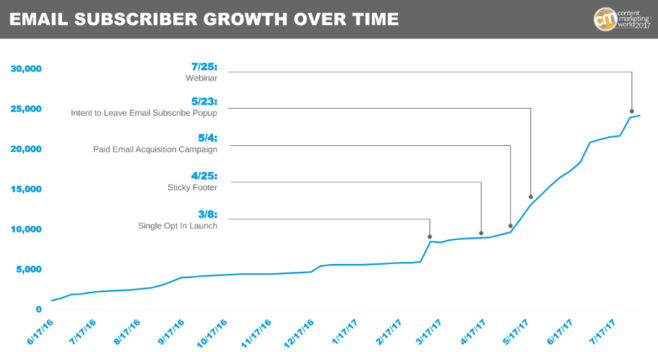 This chart shows the subscriber growth from various sources during the 12 months leading up to July 2017. The newsletter has been a big win for the company, garnering an open rate double of the American Funds Insights newsletter, another Capital Group offering. Even better? It gives Capital Group a reason to connect with its best customers weekly, people who otherwise might talk to a Capital Group representative once a quarter. Then, of course, there’s the content. Every Friday, the Capital Ideas newsletter offers a curated list of the site’s best content plus some extra insights. The takeaway: If you’re going to launch a newsletter as part of a content brand, be prepared to invest enough time and energy ­– over and over – to make it outstanding. To get your message out, there’s nothing wrong with tapping in to external audiences, including influencers. But don’t forget to also tap in to employees. “Amplify from the inside out,” Fred says. For example, to entice Capital Group sales employees to participate, Will and Fred’s team created challenges: Who can get to a hundred subscribers first? Who can get a hundred advisors in your territory to sign up by the end of the year? To make the platform even more useful to Capital Group employees, the team designed the site in formats easily displayed on a screen for presentations. Fred’s advice: Think deeply about who your internal proponents could be. Create relationships throughout the company. Fred calls impression stats “the biggest lie in marketing.” That’s no surprise to anyone who’s familiar with content marketing. Instead of promotions based on banner ads, Capital Ideas relies on paid social promotion, mostly on Twitter and LinkedIn because that’s where the audience is. To round out the promotion strategy, the team invests in content syndication through Dianomi, which focuses on financial services content, and tested Taboola and other services. 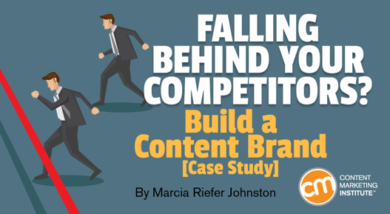 If your brand needs re-energizing, consider creating a content brand, as Fred and Will’s Capital Ideas team did. 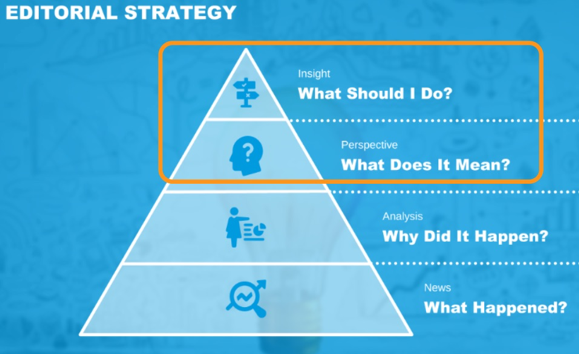 When you do, or when you optimize existing content initiatives, see what you can learn from the Capital approach. If you have a content brand, how has it helped turbocharge your marketing? Learn more firsthand success stories to inspire and inform your content marketing programs. Register today for Content Marketing World Sept. 4-7. Use code BLOG100 to save $100.